Meyer Turku has floated Costa Cruises’ first LNG-powered cruise ship, Costa Smeralda, out of her building dock at its yard in Turku, Finland. Following a traditional ceremony to mark the construction milestone, the 180,000gt ship was moved to Meyer Turku’s outfitting pier where she will remain until her delivery in October 2019. Once complete, the ship will offer a three-level area in the middle of the ship that will host entertainment, Italy-inspired piazzas, 11 restaurants, 19 bars, a water park with slides, a multi-sport field, four swimming pools, theatre, disco, casino, jazz club piano bar, a games room and a spa, which has a beauty salon, hammam, thalasso therapy pool and 16 treatment rooms. The vessel will also have her own onboard museum called CoDe - Costa Design Museum, which will be curated by Matteo Vercelloni and showcase the “excellence of Italian design” by featuring many of the people who have contributed to the ship's construction. 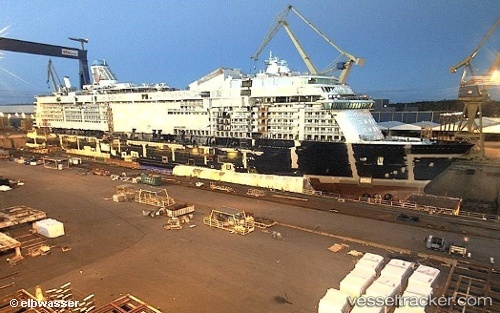 Finnish shipbuilder Meyer Turku has officially started building Carnival Cruise Line’s first LNG-powered ship, which will be the largest-ever vessel in the line’s fleet when she debuts in 2020. Meyer Turku marked the start of construction by hosting a traditional steel-cutting ceremony for Carnival executives and other invited guests. The shipyard is scheduled to deliver the 180,000gt XL vessel in 2020, when she will become the first in North America to operate using LNG fuel. The newbuild, which will offer various onboard innovations, will be joined by a sister in 2022 – the same year that Carnival celebrates its 50th anniversary. Finnish Port of Turku has unveiled an ambitious development programme and the key players - Viking Line Abp, Tallink Silja Oy, Port of Turku Ltd and the City of Turku - have therefore signed a joint letter of intent to increase the attractiveness of the area. Viking Line’s and Silja Line’s separate terminals will make room for a single, state-of-the-art terminal.